There's no shortage of quotes and sayings about the subjective nature of taste - pick your favorite. Just because a reviewer prefers mozzarella di bufala to cow's-milk mozzarella doesn't make the one inherently better than the other. And one person's appreciation of goat cheese has no bearing on whether or not anyone else is going to enjoy Firefly Farms' Allegheny Chevre. I write about cheeses I've enjoyed and the shops where I find them because they represent my individual frame of reference. Really good cheeses present a wonderful variety of flavors and textures, and there are plenty of bland or unpalatable cheeses out there that offer clear comparisons. But it's just like tasting wines - no matter what experts may tell you about the sample in front of you, it comes down to personal experience. Thankfully, D.C. Foodies have no shortage of opportunities for experiences of their own when it comes to cheese. With so many restaurants highlighting farmsteads and small producers on their cheese plates, almost every meal can offer a chance to sample a new cheese or three. Even better, there are an impressive variety of cheese tastings and classes on offer throughout the area at any given time. More than merely allowing you to taste a given cheese, these formal tasting opportunities can offer pairing advice, recommendations of similar cheeses and details that the average restaurant server may not know. Rather than give you my thoughts this week, I wanted to provide you with a couple of upcoming opportunities to do some tasting of your own. This list is by no means exhaustive - and I would welcome anyone who knows of other upcoming events to share them so I can add them to the list. And if you happen to attend any of these events, please let me know - I'm always eager to hear someone else's impressions of classes, tastings and (of course) the cheeses themselves. This class, run by TasteDC.com, will feature a presentation on cheese making, purchasing, storage and pairings by Michael Kiss, who sources cheeses for Whole Foods here in Washington. 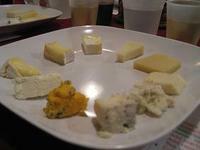 For $65 per person, the class will offer a tasting of 9 artisanal cheeses, wine tastings and a light dinner. For more information, or to sign up for the class, visit TasteDC.com's website. Like the general introduction to cheeses offered by TasteDC.com in February, this $65 class will offer a tasting of 9 cheeses, wine pairings and a light dinner. But the focus of this class will be some of the 400 unique varieties of cheese produced throughout France. It will include a discussion of regional variations in French cheese-making and will likely touch on the difference between the raw-milk cheeses produced and consumed in France and their American counterparts. For more information, or to sign up for the class, visit TasteDC.com's website. This class, offered by L'Academie de Cuisine in Bethesda, is less about tasting cheeses themselves than it is about cooking with cheese. This is a demonstration class that will feature recipes for: cheese and ham strudel; raj rabbit; Boursin with focaccia crisps; Gorgonzola gougere; and honey blintzes. The cost is $65 per student. Contact L'Academie de Cuisine for more information. Additionally, both Cowgirl Creamery and Cheesetique offer frequent cheese classes, though neither one has any classes currently scheduled. 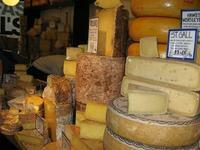 Cowgirl tends to offer classes that focus on specific regions, production methods, or styles of cheese. Unfortunately, their classes are generally offered only once or twice each, so you need to be sure to sign up right away if something catches your eye. Cheesetique, which will soon be moving into a larger space a few doors down from their current location, offers the same class five or six times per month, and their themes are often a bit broader in scope than those of Cowgirl. Keep an eye on both of their websites for announcements of upcoming cheese classes. After returning from a trip to Italy, Paula Lambert started the Mozzarella Company in Dallas, Texas, in 1982. She has been making fresh mozzarella and other products ever since, and she is the author of "The Cheese Lover's Cookbook" as well as her new book, "Cheese, Glorious Cheese," which she will be discussing at this event. Tickets are $35 per person and space is very limited, so call Cowgirl Creamery soon (202-393-6880) if you want to attend. TasteDC.com is billing this as the "must attend" event for DC cheese lovers - over 40 cheeses with an emphasis on smaller, artisanal producers; 25 wines selected for their ability to pair with various styles of cheeses; handmade pastries from Patisserie Poupon; and a full buffet-style dinner. Tickets are $65 in advance or $80 at the door. This sort of event is a great way to try a lot of new cheeses at once, though it's often hard to keep track of exactly which ones you liked and which you didn't unless you take good notes. Once again, details and signup can be found at TasteDC.com's website. Actually, it is the February issue-I just got it in the mail today. 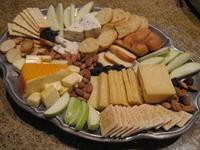 DC cheese lovers might also want to check out www.cheeseplates.net, a blog devoted to the art of the cheeseplate.